This specimen was collected from the early Miocene of Patagonia. It was made available to DigiMorph by Dr. Amy Balanoff of the American Museum of Natural History. This specimen was scanned at Stony Brook University Hospital using a GE Lightspeed 16 medical scanner. The interslice spacing was 0.1 mm, and the interpixel spacing was 0.1875 mm. Bertelli, S., Giannini, N.P., and Ksepka, D.T. 2006. Redescription and phylogenetic position of the early Miocene penguin Paraptenodytes antarcticus from Patagonia. American Museum Novitates 3525:1-36. 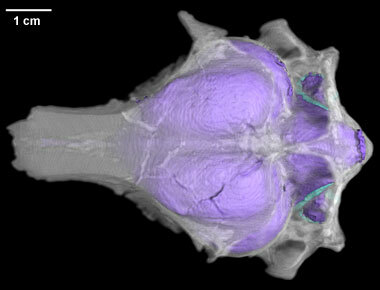 Click on the thumbnail to the left for a roll animation (3.8 mb) of the Paraptenodytes endocast rendered within the semi-transparent braincase. Click on the thumbnail to the left for a roll animation (2.6 mb) of the Paraptenodytes endocast. Click on the thumbnail to the left for a yaw animation (2.3 mb) of the Paraptenodytes endocast. Click on the thumbnail to the left for a pitch animation (3.0 mb) of the Paraptenodytes endocast. To cite this page: Dr. Daniel T. Ksepka, A.M. Balanoff, S. Walsh, A. Revan and A. Ho, 2012, "Paraptenodytes antarcticus" (On-line), Digital Morphology. Accessed April 24, 2019 at http://digimorph.org/specimens/Paraptenodytes_antarcticus/.